Hello! Happy Tuesday! 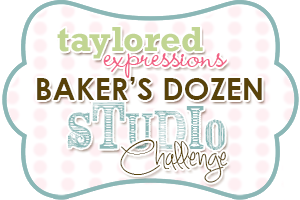 Welcome to the August Baker's Dozen Studio Challenge. This is an opportunity for us to share what makes our stamping studios hum. Each month we will have a fun, crafty question so we can share our favorites, some tips and tricks, stamping advice and more. PROJECT RUNWAY! Do you watch this show? I have to be honest - I've never seen an episode. However, I'm told that it's perfect for creative types like us! On PR, the designers are given crazy challenges each week and asked to maintain their own personal style or point of view in their creation. We were asked - So what's your stamping style? Hmmm... It's actually very hard for me to describe my stamping style. I like a lot of different things - everything from cutesy to vintage to elegant to graphic and a lot in between! 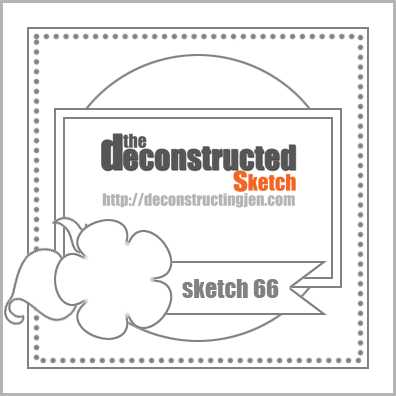 My card style is much different from my scrapbooking style. My scrapbook layouts tend to be more practical, and I don't go crazy with a lot of layers or embellishments since most of them go into page protectors in my albums. I try to let the focus fall to my photos and/or the story that I want to tell. On the flipside, I tend to add a lot of layers to my cards, especially with foam tape - suffice it to say that 99.9% of my cards are not mail-friendly. In fact, whenever I mail a card, I always have to consider it a "package" and not a letter. LOL! And, finally, whether scrapbooking or card making, I tend to add stitching to most of my projects. I just love the look that it adds! My second card is an easel card. I don't consider myself a "technique-y" type of crafter, and most of my cards are usually standard cards, but once in awhile I do like to make an easel card. 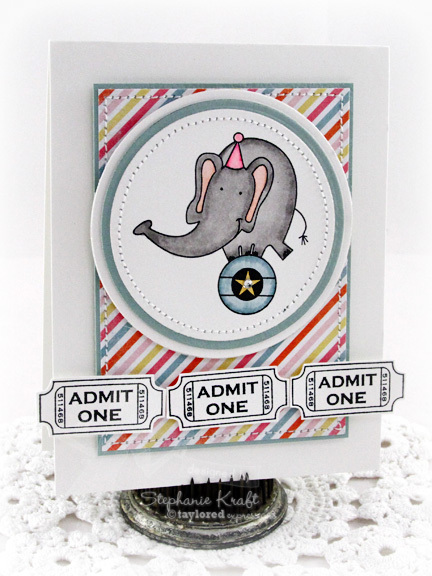 If you've never made one, here's a link to an easel card tutorial on Splitcoast. They are fun and easy to make! This time I used the sweet train image from Life is a Circus, once again stamping and coloring with Copic markers. 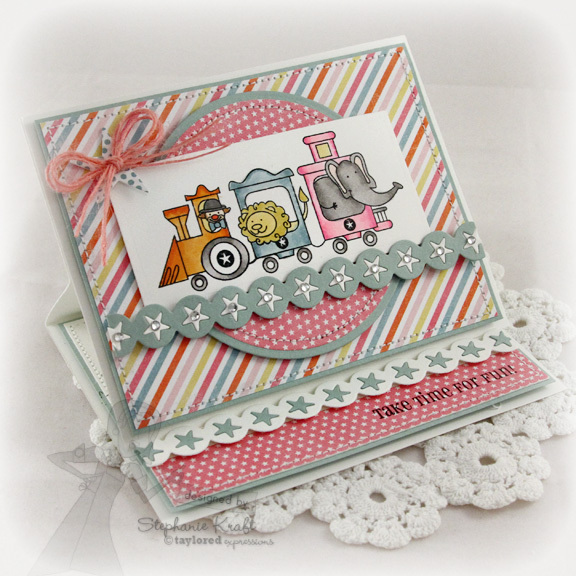 I used the Star Border Die to create my borders on the outside and inside of the card. I cut the border out once in Choice Snow White and once in Island Mist Light, then I switched the star cut outs on each border. I also die cut a polka dot star using the Seeing Stars Dies, popped it up in the upper left corner, and tied off a bow with Pink Burlap Twine. Life is a Circus is a set of 17 images and sentiments. It was illustrated by Doug Applegate and is part of his Apple Doodle Ink line. Accessories: Standard Circle - SM and LG Nestabilities (Spellbinders), Markers (Copic), Silver Rhinestone (Kaisercraft), Foam tape, Thread, Sewing machine. 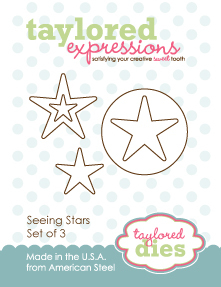 Accessories: Star Border Die, Seeing Stars Dies (Taylored Expressions); Standard Circle - SM and LG Nestabilities, Long Rectangle Nestabilities - LG (Spellbinders); Markers (Copic), Silver Rhinestones (Kaisercraft), Pink Burlap Twine (May Arts), Foam tape, Thread, Sewing machine. OMWerd....Steph, these are darling!!! LOVE the easel card. That is one paper pad I didn't think I needed! But I need it now! These are wonderful Stephanie! I really like your CAS card... that ticket string is awesome and your DS card is fabulous... love those diagonal stripes! Well, these are fan-flipping-tastic!! I ADORE each and every card you make, and these are no exception! These are both amazing...LOVE all the details you add!!! FABULOUS!! I envy your ability to layer cards, BUT, your CAS is adorable! Love the coloring and I LOVE the ticket border! Your easel card is awesome, I love the colors and the star border...everything is so perfectly put together! LOVE these! Oh goodness, these are the cutest ever!!! 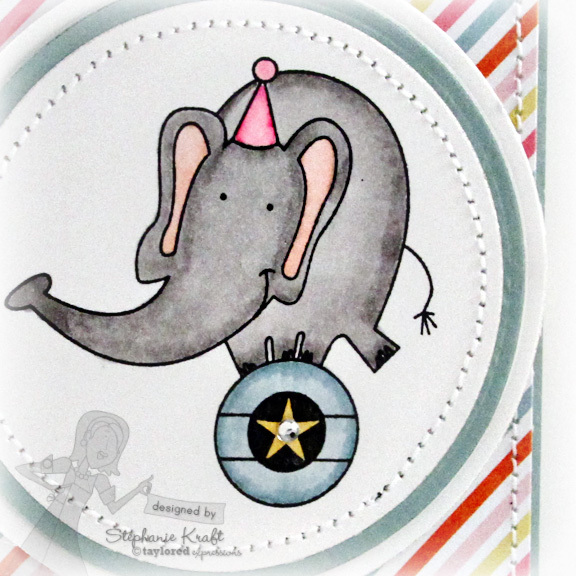 I adore your style and these super cute card just make me smile. 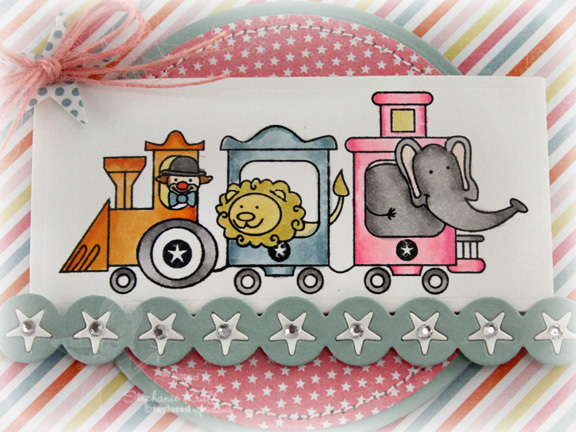 Love the ticket strip and of course, love that happy little train! Wonderful! First, great stitching, stitching in a circle scares me! Love the colors and papers. Love how the star border looks. These images are darling! You did a great job on your cards! Super cute cards Stephanie! 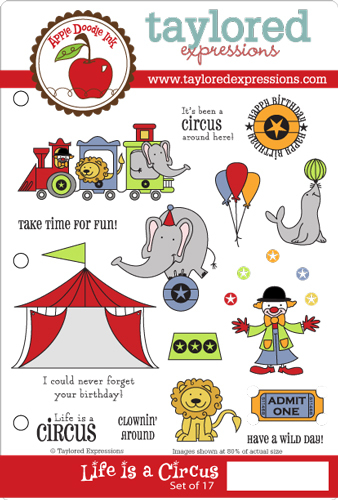 Love the circus theme! Great mix of pretty patterned papers!